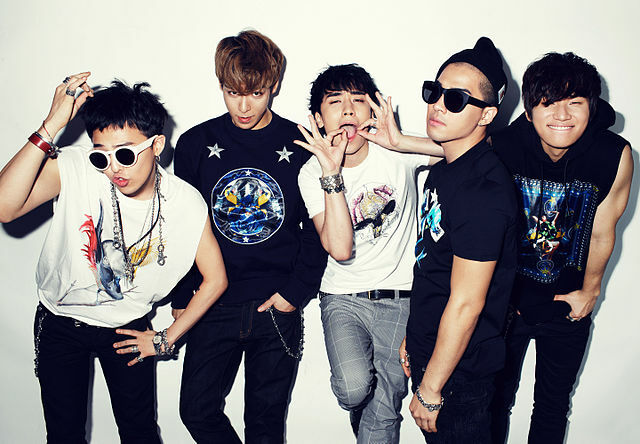 Big Bang (Korean: 빅뱅) is a South Korean boy band formed by YG Entertainment. With members G-Dragon, T.O.P, Taeyang, Daesung, and Seungri, they are often cited as one of the most influential acts to shape the K-pop industry by helping spread the Korean Wave internationally and dubbed as the "Kings of K-pop" by the media. personal involvement in producing their own records, and stage performances have been admired by music critics and served as influence to numerous K-pop and international artists. Despite their debut album, Bigbang Vol.1 (2006), receiving lukewarm reception, success followed with a string of notable hits credited to the quintet, including "Lies" (Korean: 거짓말), which topped major Korean music charts for a record-breaking six consecutive weeks and won Song of the Year at the 2007 Mnet Km Music Festival and the 2008 Seoul Music Awards; "Last Farewell" (Korean: 마지막 인사); "Day by Day" (Korean: 하루하루); and "Sunset Glow" (Korean: 붉은노을). After receiving the Artist of the Year award from the 2008 Mnet Korean Music Festival and the 2008 Seoul Music Awards, the group expanded their endeavors to Japan, releasing four studio albums, Big Bang (2009), Big Bang 2 (2011), Alive (2012), and Made Series (2016), which are all certified gold by the Recording Industry Association of Japan. A two-year hiatus in South Korea saw forth increasingly critically acclaimed albums. Their fourth EP, Tonight (2011), lead to their emergence as the inaugural Best Worldwide Act winner at the 2011 MTV Europe Music Awards. Their fifth EP, Alive (2012), became the first Korean album to chart on the Billboard 200. Their widely acclaimed third album, Made (2016), was preceded by several chart-topping singles, winning the group their third Artist of the Year award at the 2015 Mnet Asian Music Awards and their first at the 2015 Melon Music Awards. The supporting world tour gathered 1.5 million people in attendance, making it the most attended concert tour headlined by a Korean act in history. Big Bang has a record of 18 number-one songs that have collectively remained atop South Korean's biggest online music service Melon for 51 weeks, more than any other act. The quintet have sold over 150 million records and counting, making them the biggest-selling boy-bands in the world beating out American favorites like the Backstreet Boys and the Jackson Five. Forbes Korea ranked them as one of the most powerful celebrities in South Korea in 2010, 2012, 2013, 2014, and 2016. They were also the first Korean artists to enter Forbes's Celebrity 100 and the 30 under 30 list of most influential musicians in the world, in 2016 and 2017, respectively.